In the context of this cold weather, it is perhaps appropriate that my kitchen has also featured soup. I look forward to sharing recipes soon. More soup making was one of my 2018 aspirations and it is going well so far. Spring might not be here yet, but we have started on hot cross buns. 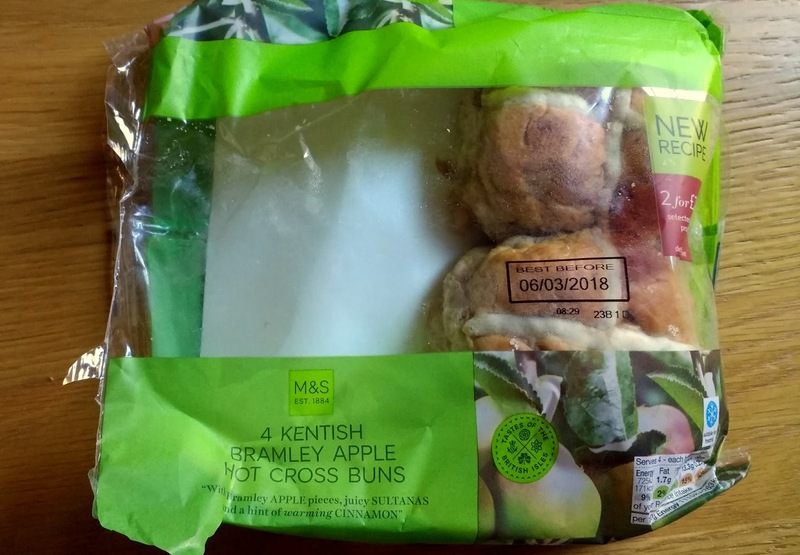 Marks and Spencer make some accidentally vegan apple hot cross buns that I love. I am also very fond of the Divine range of dark flavoured chocolate bars. 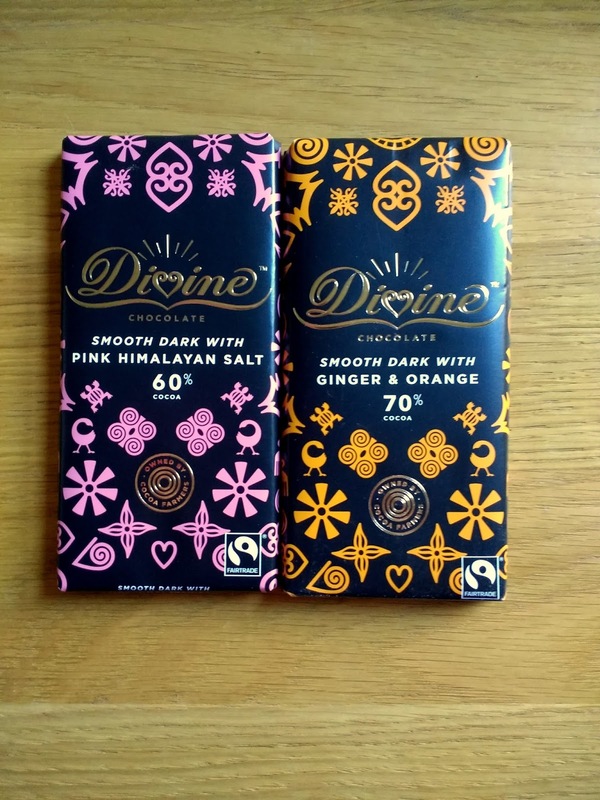 They have been on special in Waitrose and I bought the salted chocolate and ginger-orange chocolate varieties. Waitrose also delivered re-packaged 'skinni' wraps by Deli Kitchen. I enjoyed these when they were released in 2017 but they then disappeared from stores for a while. 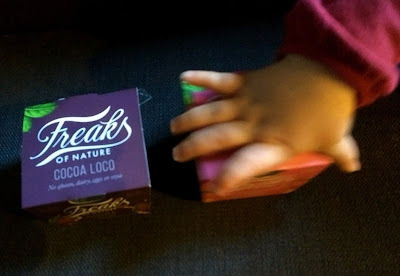 They are back with new packaging but the same enjoyable taste and texture. In my kitchen have been some dessert pots by Freak's of Nature - also bought on special, although they were still quite pricey at £1.50 each. My efforts to photograph them were interrupted by Mini Bite taking great interest in the proceedings. In my kitchen is the book Prairie Fires by Caroline Fraser. 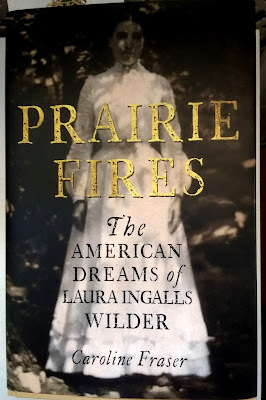 Did anyone else grow up loving the Little House books by Laura Ingalls Wilder? This book offers behind the scenes insight into the reality of Laura's life, which was not always as settled or idyllic as her books. Last but not least, my kitchen has featured a medal from the recent Tunbridge Wells half marathon. Building on my less preparation/faster time experience late last year, this race saw even less preparation and an even faster time. I finally managed a sub-2 hour time, coming in at 1 hour 58 minutes. Fortunately that day was aided by lovely sunny crisp weather to aid me round the course! 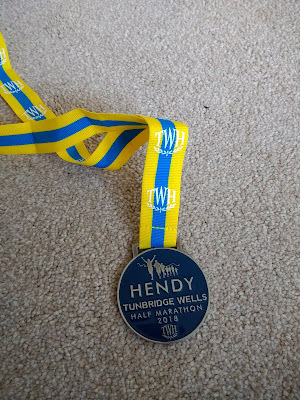 Congratulations on the medal - I'm always so impressed by anyone that does that sort of running. I was just looking for vegan hot cross buns the other day, and couldn't find any, so I'm getting down M&S at the first opportunity. Thank you for the tip! 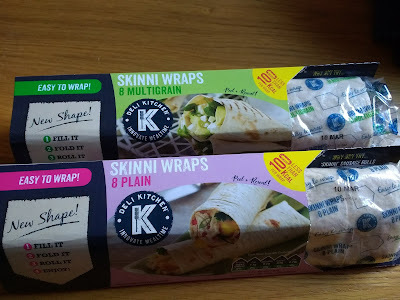 You are very welcome :-) Tesco have some vegan ones too! Are they one-a-penny two-a-penny? As in the Mother Goose rhyme? Glad the snow held off for the marathon - great achievement! 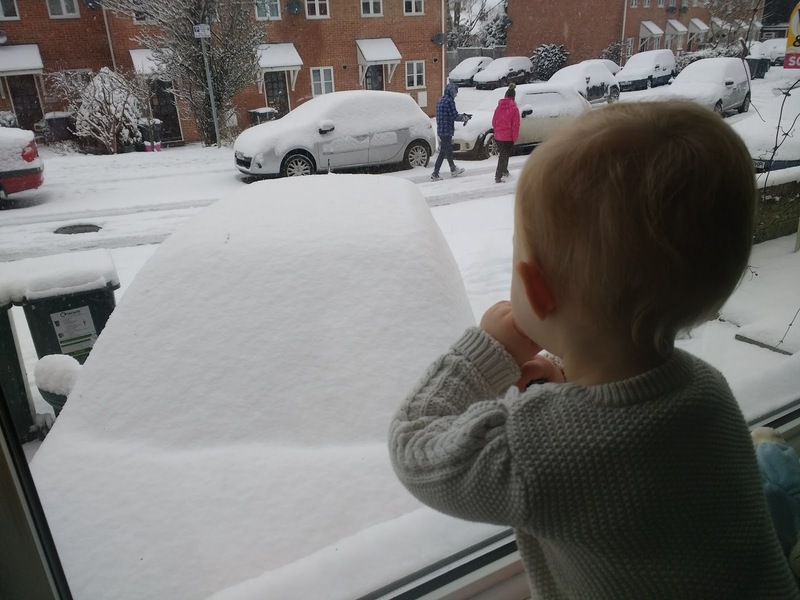 And mini bite looks so cute watching the snow. I am trying to hold off on hot cross buns but it is getting harder. I figure once we're in the month of Easter, it's ok! 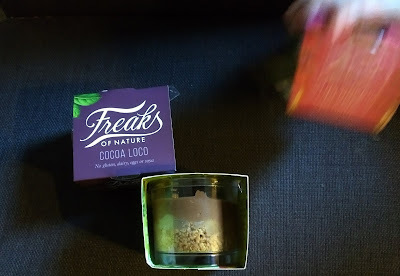 Love the photo of Mini Bite at the window (and investigating the dessert pots). This has definitely been a season for big kettles of soup; comfort food and big-batch cooking all in one pot. Wow all that snow. My boys really want to see snow, they never have and they are 13! One day! Congratulations on running the marathon and the achievement. I remember seeing those apple hot cross buns at M&S last year and was tempted, i will try them this year now that you have reminded me. 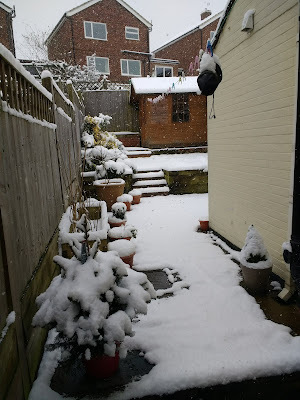 As for the snow, yes - we had 3 foot of it and its still melting. Adore the photo of minibite staring out the window. Hoping to join in IMK but may not this month. You are obviously colder in Wales than here! Still melting - goodness. I hope you get some signs of spring soon. Congrats on finishing the half marathon in a faster time. Apple hot cross buns sound delish. The photo of Mini Bite gazing at the snow is very cute. Thanks for the info on Prairie Fire. I'm adding it to my to read list! I love when things are accidentally vegan! 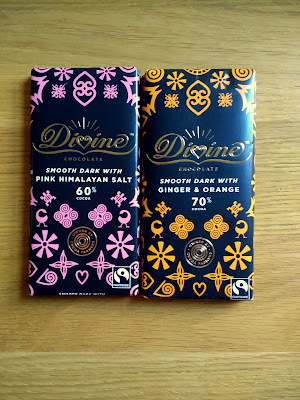 I like those Divine bars, I haven't tried the salted one yet - it sounds delicious. It's funny, I watched the show Little House on the Prairie, but never read the books. "this race saw even less preparation and an even faster time." It's funny how that works. I'm starting to notice that with less preparation, I'm quicker as well. I think it helps not to worry about it so much too.